Shakyamuni Buddha: He or she needs to keep in view, fully and in detail, the five aggregate factors of his or her experience and those as devoid of self-establishing nature. These words have I heard. At one time, the Vanquishing Master Surpassing All was dwelling at Vulture Peak Mountain, by the Royal City of Rajagriha, together with a great assembly of the monastic sangha and a great assembly of the bodhisattva sangha. 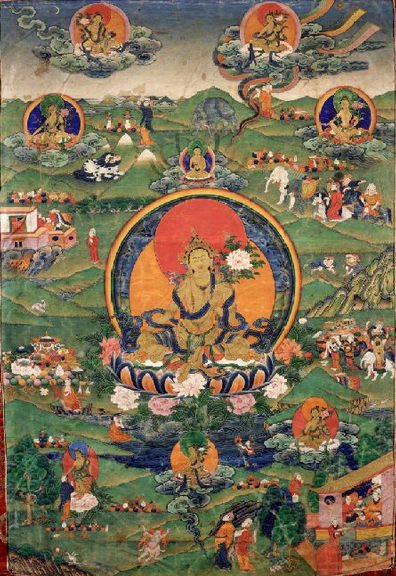 Also at that time, the bodhisattva great-minded mahasattva, the Arya Avalokiteshvara, the Powerful Lord Beholding All Around, conducting his behavior in profound and far-reaching discriminating awareness, was beholding all around, in detail, like this: He was beholding all around, in detail, the five aggregate factors of his experience and even those as devoid of self-establishing nature. “He or she needs to keep in view, fully and in detail, the five aggregate factors of his or her experience and those as devoid of self-establishing nature. Form – voidness; voidness – form. Form not separate from voidness; voidness not separate from form. (What has form, that has voidness; what has voidness, that has form.) Similarly, feeling, distinguishing, affecting variables, types of consciousness – voidness. It’s like that, Shariputra, with all phenomena – voidness: no defining characteristics, no arising, no stopping, no being stained, no being parted from stain, no being deficient, no being additional. “Because it’s like that, Shariputra, in voidness, no form, no feeling, no distinction, no affecting variables, no kind of consciousness. No eye, no ear, no nose, no tongue, no body, no mind. No sight, no sound, no smell, no taste, no physical sensation, no phenomena. No cognitive source that’s an eye, up to no cognitive source that’s a mind, (no cognitive source that’s phenomena), no cognitive source that’s mental consciousness. No unawareness, no elimination of unawareness, up to no aging and death, no elimination of aging and death. Likewise, no suffering, cause, stopping, and pathway mind. No deep awareness, no attainment, no non-attainment. “Because it’s like that, Shariputra, through there being no attainment of bodhisattvas, he (or she) lives, relying on far-reaching discriminating awareness, with no mental obscuration. (Because of there being no mental obscuration,) there is no fear, gone beyond what’s reversed, (thus) nirvana release, complete to the end. In fact, it’s by relying on far-reaching discriminating awareness that all Buddhas arrayed throughout the three times are full manifest Buddhas in peerless and perfect full Buddhahood. When the Vanquishing Master Surpassing All had pronounced those words, the venerable Son of Sharadvati, and the bodhisattva great-minded mahasattva, the Arya Avalokiteshvara, and the pair of assemblies of those endowed with all, as well as the world – gods, humans, anti-gods, and gandharva heavenly musicians – rejoicing, sang praises of what had been declared by the Vanquishing Master Surpassing All. Tib. “Shes-rab snying-po,” Skt: “Bhagavati Prajnaparamita-hrdaya” translated by Alexander Berzin.